Recently, I got to take my dream vacation – the number one place I had always wanted to go my whole life: Paris and Disneyland Paris! I wanted to go to Paris for obvious reasons; the gardens, the architecture, the cafes, the food, the shopping, the historical significance…and of course, being a Disney fan, I just HAD to make a trip to the Disneyland Paris Resort as well. So many people have been asking what I thought of the resort, what the park was like compared to the Disney resorts in the states, etc., so I would love to give you a look into my time there! I stayed on resort property for five nights, six days, at Hotel Cheyenne. There are several beautiful hotels on site, including the most famous, the Disneyland Hotel – which sits right above the Disneyland park entrance, complete with a view of Main Street and the castle! Gorgeous, right? I also loved Hotel Cheyenne, where I stayed. It’s a western themed hotel, and my newly remodeled room was Toy Story themed! It had a couch, a super comfy bed, and large TV (the only English channels are Disney channels, but that’s fine by me)! Even though I traveled into town frequently to see other things in Paris besides Disneyland, I still loved staying at the resort. Literally, right in front of the resort entrance is a train station, so you can get into the heart of Paris in about 40 minutes, while enjoying a train ride. It was also nice to be able to come back each day to enjoy a few rides at the end of each night (since your hotel stay comes with park hopper tickets). What I also love about staying at Disney, was the great value. When you stay at a Disneyland Paris hotel, your breakfast is included. They had cheese, fruit, meats, and as many croissants, pain au chocolats, and nutella as your heart could desire! Your hotel stay also comes with park hopper tickets for both Disneyland and Walt Disney Studios – no extra fee for park hoppers! You also get to go into Disneyland an hour early before park opening (two hours earlier on weekends). Another bonus? There are almost always great specials going on for a stay at Disneyland Paris. When I booked, they had a buy three nights get two free. Two FREE hotel nights, park days, and breakfasts? Yes please! Just like how the food in Paris is amazing, so is the food at Disneyland Paris! They have lots of little bakery walk-up windows along Main Street, perfect for when you’re waiting for the parade to start. It felt extra Parisian to be waiting for the Disneyland Christmas parade with a croissant and pain au chocolat! The quick service meals are also incredible! I ate at Hakuna Matata in Adventureland, and it was delicious. I had a veggie salad, which so often aren’t full of delicious veggies, but this one was so refreshing and with lots of variety of veggies. The meals also come with a drink, side dish, and ice cream bar, for around $9-$12. You can even smell the amazing aromas of the quick service food as you walk by the restaurants – particularly from the Main Street deli, who carries delicious sandwiches, bruschetta flatbread, and desserts. I am absolutely obsessed with the bruschetta flatbread! All the food I had tastes high quality and fresh! The service was impecable, and the food divine! From drinks to desserts, it was all perfection. The atmosphere of the restaurant is pretty great too, and celebrates Walt Disney’s life, with many pictures of him from when he was a baby to when he started Disney. At Disney Village (Disneyland Paris’ version of Downtown Disney), they had a Christmas Market, little pop-up stands with different Christmas treats. They were all very affordable, and so delicious (and made fresh). I had a Nutella crepe, and my favorite French treat: Marron Chauds (Roasted Chestnuts)! At Walt Disney Studios park, we ate lunch at Bistro Chez Remy. Talk about a restaurant with amazing theming! It looks just like Chez Remy at the end of the movie “Ratatouille”. I ordered the vegetable entree, which was green beans, carrots, cauliflower, and white beans in a buerre blanc sauce. It also came with a salad and a side of ratatouille, of course! Their Pirates had a lot of similarities, but didn’t have the live action Pirates of the Caribbean animatronics. I did like their Small World a bit better, it seemed more brightly colored, and updated! Their train is fantastic, it is so beautiful and goes all around the gorgeous resort. The attractions are super fun, and magical as always, but my favorite part about the whole Disneyland Paris experience is the atmosphere! The paths are so wide open, and just like how there are lots of magical nooks and crannies in the city of Paris, Disneyland Paris has lots of beautiful areas to sit and savor your time at the parks. There are countless beautiful garden and courtyard areas with benches to rest, eat, people watch, or watch the parades. The parks, even on a weekend, never felt overwhelmingly crowded. The architecture is picture perfect as well. The Main Street is impeccable, and feels so cozy. I feel like all the shops and restaurants are perfectly decorated, from top to bottom. I also love that on both sides of Main Street there are covered walkways, so that you can get to the shops and from the beginning to the end of Main Street while avoiding parade crowds, or to keep warm in the colder months. The Main Street window displays are all filled with Disney characters, and have holiday overlays. The beginning of Main Street is filled with holiday magic, having a decorated gazebo, a gorgeous Christmas tree, lit Christmas trees, and fake snow (but it looks pretty real). The Discoveryland (their version of Tomorrowland), has an industrial revolution/steampunk twist, which is fabulous and a sight to be seen! In my opinion, I thought the castle was the prettiest of the resorts I’ve visited. The turrets have beautiful twinkle lights, the inside has gorgeous stained glass windows that tell the story of Sleeping Beauty. And underneath the castle, is an amazingly realistic looking animatronic dragon, which just blows me away! I also of course have to talk about how amazing the Ratatouille ride is! It is definitely one of my top ten favorite rides of all the Disney resorts I’ve been to! Definitely get there first thing in the morning, or get a fast pass, as it tends to get a long line. This Disney park is definitely one for any Disney lover’s bucket list! And if you’re ever wondering if you should stay on property, I can’t recommend it enough! The train ride to Paris is fun and convenient, and no better way to end a magical Paris night then by seeing Disney Christmas parade or nighttime castle show! 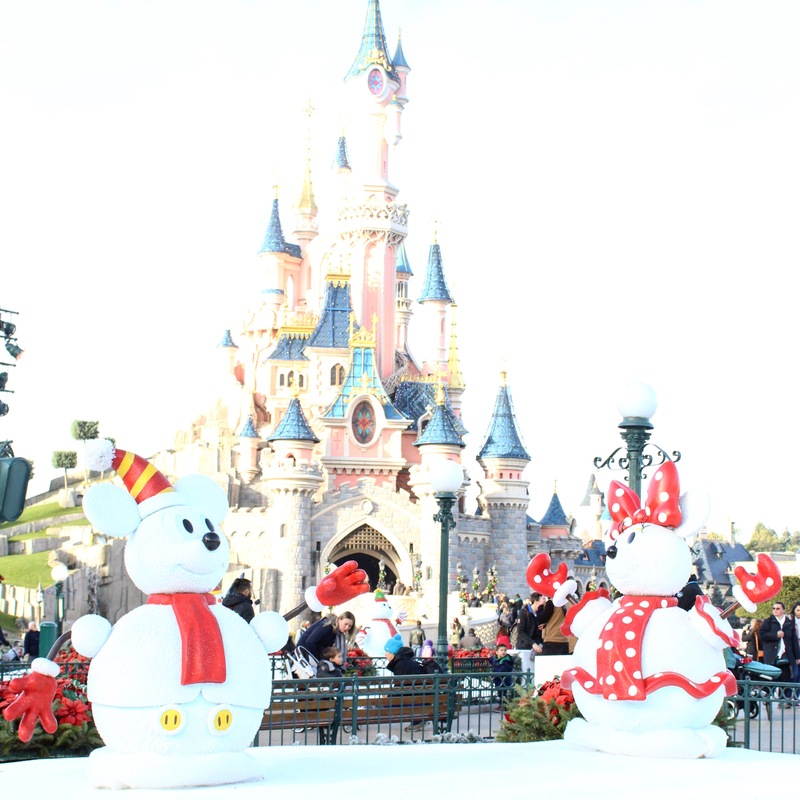 And if you can visit Disneyland Paris someday, I highly recommend going at Christmas time – they had more decorations than any other park I’ve been to in the States!